Brambles Barn is located in an isolated location in the countryside. The original agricultural barn did have a water connection but did not have an electricity supply. When Prior Approval to convert the barn into a dwelling was achieved, the energy position of the proposed dwelling was assessed. It was soon determined that a fully integrated renewable off-grid system could provide a reliable source of energy for the 2 bedroom property. The initial cost of such a system can be high, but in this case was equivalent to connecting to the national grid. However, once completed, the off-grid system will provide free energy to the house year round. The system for both electricity and hot water is primarily powered by the sun. A new barn is being built on the site, designed and located specifically to house a solar PV array. The 6.6Kw array, formed by 22 x 300w panels, fills the southern roof. The power produced is routed to the plant room of the development which is a re-purposed shipping container. 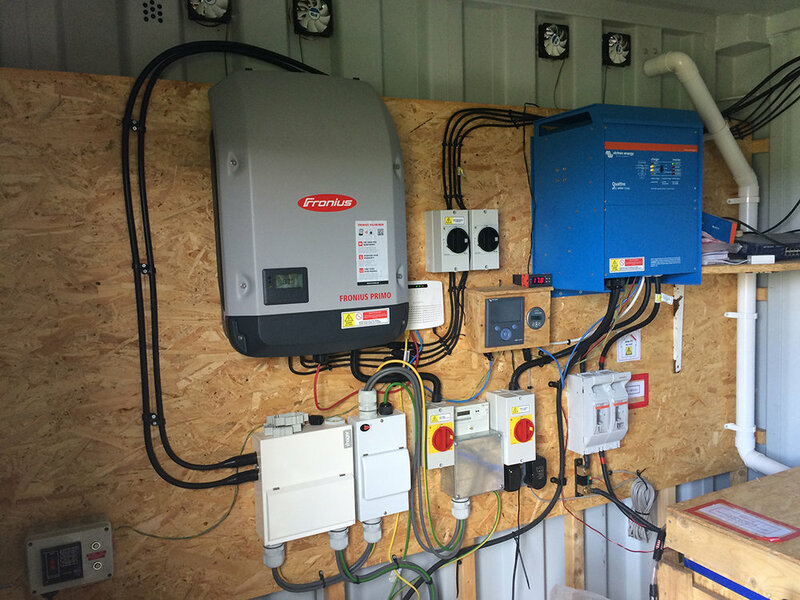 In the shipping container the Fronius PV inverter tracks the solar panel output (MPPT) and converts DC into AC. This produces a clean and stable output to the brains of the system; the Victon Quattro inverter/charger. The Victron is connected to all power inputs and outputs and it redirects the power where it is needed at any one point in time. As solar power is not a constant source throughout the day, a method of storing the power produced in the day so that it can be used at night is required. For this system we opted for a large but simple 40Kw lead battery bank. The peak daily consumption of the proposed dwelling was calculated to be 7Kw in the depth of winter and based on the desire that the house could function for a 4 day period without sunlight recharging the battery, it was concluded that an accessible power storage of approx 20Kw would be desirable. To maximise efficiency of this type of lead battery, they should only be discharged to 75% of their capacity; i.e. You only use 10Kw of a 40Kw bank. However in winter a depth of discharge of 50% would be acceptable on the rare occasion, therefore providing 20Kw of usable power from a 40Kw bank. This should theoretocally allow 4 days of average consumption before the batteries require recharging. As with all off-grid systems, if reliability is required there should always be a non-weather-dependant back-up supply. In this case, as it should only ever have to kick-in on the rare occasion, we opted for a gas powered generator. The generator is fully integrated into the system so that is reacts to high load demands and low battery levels, automatically starting to take up the slack. In the summer the solar PV system is expected to massively over-produce power compared to the required demand from the dwelling. As the development is not connected to the national grid it cannot export excess energy. Instead, this excess can be automatically dumped into the dwelling's hot water system if it is not already at full capacity. Beyond this, the excess energy will only be utilised if the occupants have need for it, i.e. They intend to run a electric kiln in the summer months. Each component of the system can be monitored live either locally at the dwelling or remotely via an online portal. This allows for easy access control of the system. Ease of access to the system is important as the inhabitants are encouraged to monitor power use, production and battery storage. Although the back-up generator is on hand if there is a power shortage from solar, the goal is to use the system as efficiently as possible without the generator being needed. Hot water is stored in a thermal store in the dwelling. This thermal store is directly heated from solar thermal panels mounted on the dwelling roof in a East-West array. This water heating is supplemented by the solar PV array which dumps excess loads into the thermal store when there is a surplus. This is all that is required in the spring and summer months, and much of autumn. 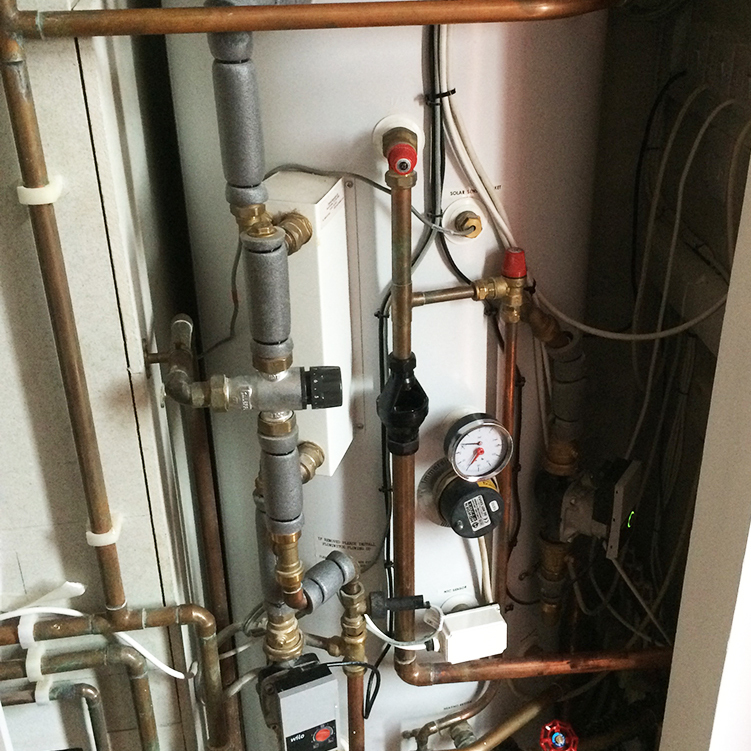 The thermal store supplies hot water to the points of use around the dwelling, including bathroom and kitchen. It also supplies the underfloor heating throughout the dwelling although this is rarely used in the warmer months. In the winter the hot water heating is supplemented by a wood pellet boiler mounted into the wall of the living space of the dwelling. Wood pellets are fed into a hopper accessed to the rear of the machine. The hopper can be loaded with enough wood pellets to last two weeks in the depth of winter.